The Galapagos Islands are one of the best places in the world to observe evolution, with a recent study observing finches on the island of Daphne Major demonstrating just how quick this process can sometimes be. Whilst many of us might assume that the evolution of a new species is something that might take thousands of years, scientists have just observed this process on the Galapagos and a completely new species evolved in much less time than many thought possible. The process took just two generations. The new paper, titled ‘Rapid hybrid speciation in Darwin’s finches’ was published in the journal Science and documents the evolution of a new species of Darwin’s finch, nicknamed ‘Big Bird’. This has now been confirmed as a whole new species, using analysis of physical characteristics, combined with genomic sequencing. Big Bird evolved from two other species of Darwin’s finches, in a process known as species hybridisation. This process was observed by Peter Grant and B. Rosemary Grant, from Princeton University, who were on expedition to the islands in the 1980’swhen they noticed a non-native species of finch on the island of Daphne Major. This species was the large cactus finch, or Geospiza conirostris, native to four of the other Galapagos Islands, but not to Daphne Major. 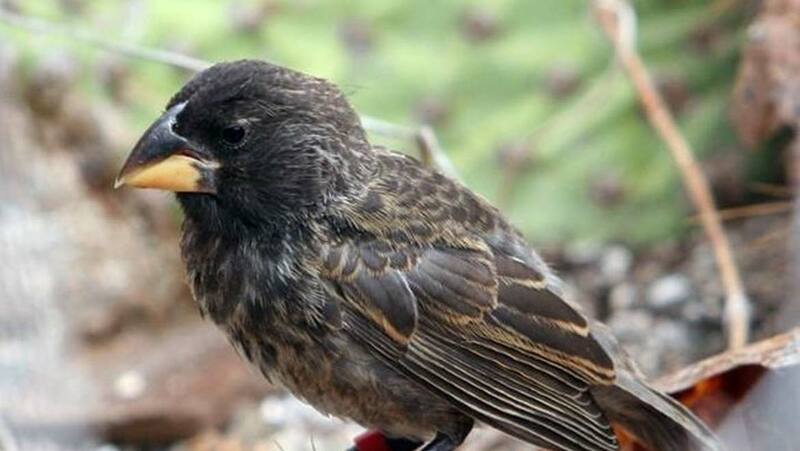 The large cactus finch then mated with two native females of the medium ground finch species, or Geospiza fortis. Usually, when different species mate, whilst they may be able to bear offspring, that offspring is usually infertile. The most well-known example of this a mule – the offspring of a male donkey and a female horse. In the instance of the finches though, the offspring of the large cactus finch and the medium ground finch were in fact fertile, which resulted in a new line of finches with distinct characteristics from either of the parent species. The beak size and shape were distinctly different, as was the song, which is used to attract a mate. This meant that to survive, the offspring had to mate with their own kind in order to survive. This came with its own set of challenges, including a drought over 2002-2003 when the new species was just four generations old. This resulted in all but two of the birds dying. Of this situation, Rosemary Grant said: “"When the rains came again, the brother and sister mated with each other and produced 26 offspring. All but nine survived to breed - a son bred with his mother, a daughter with her father, and the rest of the offspring with each other - producing a terrifically inbred lineage." Due to the difference in the new species beak shape and size, they were able to access a variety of food which was inaccessible to the native species on the island. This gave them the opportunity to exploit a different niche to any other finch on the island and as a result, the population started to increase. As of 2012, there were 23 ‘Big Bird’ finches, with eight breeding pairs. It’s quite likely that this species hybridisation has also happened before on the Galapagos, with this example only being discovered because of observant biologists and long-running field studies being undertaken in the area. As B. Rosemary Grant, emeritus professor of ecology and evolutionary biology and senior research biologist said when speaking to Futurism: “The novelty of this study is that we can follow the emergence of new species in the wild. Through our work on Daphne Major, we were able to observe the pairing up of two birds from different species and then follow what happened to see how speciation occurred.